A number of reports today are highlighting possible technical improvements for future Apple products, and while much of the information is based on patent applications that may or may not ever see the light of day, it does provide an interesting glimpse into some of Apple's areas of research. First, 9 to 5 Mac reports on a recent job posting from Apple looking for a host of new engineers focused on display technologies including LCD and/or OLED. OLED technology for Apple's displays has been a popular source of rumors dating back many years, but various technological hurdles have slowed their adoption throughout the industry. But increasing numbers of smartphones are utilizing OLED technology, increasingly the likelihood that Apple is devoting at least some effort to the technology on a test basis to evaluate it against other options. The job postings come just after a report from Patently Apple summarized a set of OLED-related patent applications filed by Apple over the past several years and published in recent months, indicating that the company is indeed thinking about how the technology could be used in future devices. A second report today from AppleInsider looks at a newly-published patent application from Apple describing a MagSafe interface capable of providing both power and data connectivity to a device. Thus, what is needed are circuits, apparatus, and methods that provide a power and data transfer system that can supply both power and data to a laptop or other mobile computing device using a single connection. To reduce the clutter caused by multiple cables, it is further desirable to have a power and data adapter that can provide power and data to the mobile computing device using a single cable. It is also desirable to have a connector system that can connect this single cable to the mobile computing device. To avoid the consequence of laptops being pulled to the ground when a cable is tripped over, it is desirable that the connector system easily disengages when the cable is pulled away from the mobile computing device. 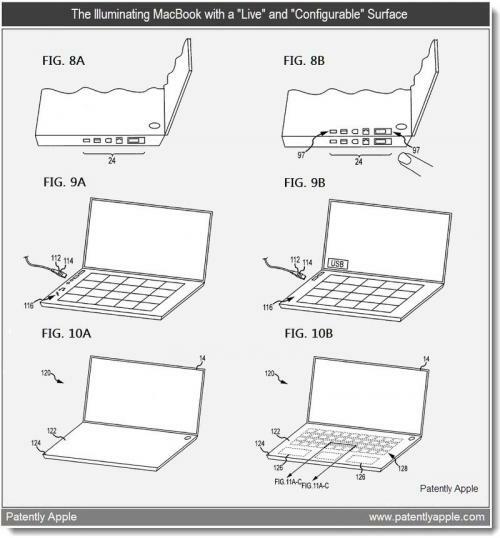 Apple's proposed solution looks very much like the existing MagSafe power connector used on its notebook computers, but with some of its contact pins devoted to data transmission such as fiber optic lines, USB, DisplayPort, or other standards. Finally, Patently Apple reports on a patent application describing the use of a device's housing as an input/output device, expanding on earlier patents addressing touch-sensitive bezels. 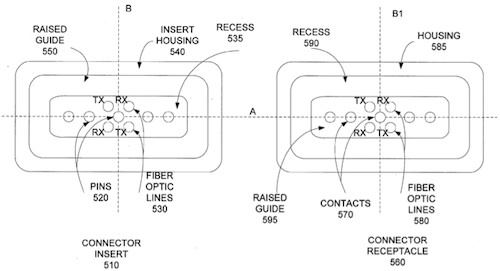 Apple's latest implementation, which could extend to computers, portable devices, and other equipment, extends use of the housing as an input/output device to also allow the device itself to reconfigure itself on a live basis. The reconfiguration would be accomplished by sensing via proximity sensors, RFID/NFC or other means such as events as the approach of a user or peripherals such as USB connectors, allowing the device to light up icons within the housing to offer the user relevant options for input via the housing or direct the user to the necessary external port required for the connector being used. Further implementations include an entire virtual surface that could display a keyboard or other input methods and allow the user to easily configure operation, such as by moving a virtual number pad or volume controls to a preferred location.